Zeus, a smaller neutered brindle male Boxer, went missing on 12/5/12 in Fort Ripley, Minnesota. 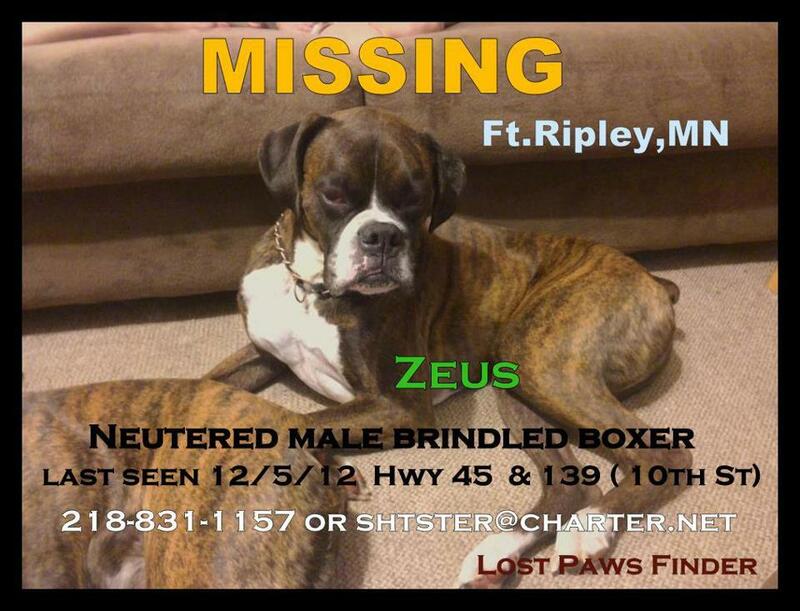 He was last seen at the junction of Hwy 45 and Cty Rd 139 ... south of Brainerd, Minnesota. He is brindle with white on face, chest and feet. He was wearing a metal choke chain with blue cloth cording weaved through the links. He is very friendly and knows his name. He is unfamiliar with the area, as this is a new home for him and he has never been in a rural setting (which may be why he can't get home). If seen or found please contact Robin @ 218-831-1157, or at shtster@charter.net . Copyright © 2013. Twin Cities Boxer Club. All rights reserved. | Saint Paul, MN. Picture Window theme. Powered by Blogger.